When and where can I buy tickets ? Our box office partner is Starticket. Tickets are available for purchase on their website: www.starticket.ch, by phone at 0800 925 925 (cost: 1.19 cents per minute), in official Starticket outlets (Coop City, La Poste, Manor and Hotelplan) or at the “Grenette”, Vevey. There is only a single rate per seating category. Only the prices of the dress rehearsal (50% reduction) and seating with limited visibility are reduced. Prices are staggered in 5 categories. 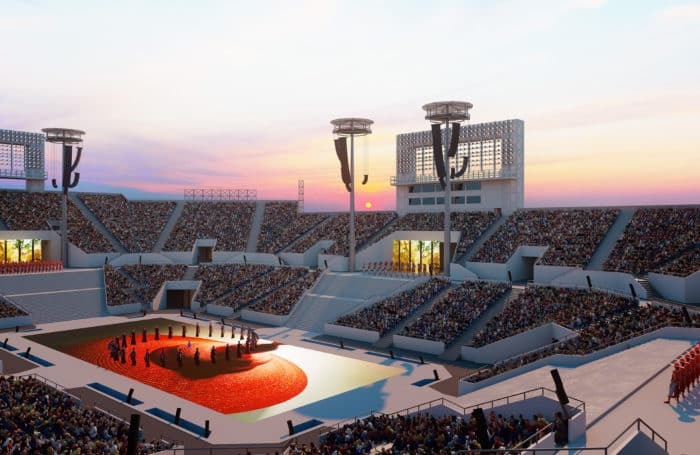 Premium tickets offer benefits such as easier access to the arena, a personalized welcome, the official programme, as well as the “Livre du spectacle”. The distribution of the categories is based on the distance from the main stage. The seating categories furthest from the main stage, which are less costly, offer a more global vision of the show. More expensive categories offer a closer view of the main stage and the show’s performers. What are seats with “reduced visibility” ? Some places have reduced visibility due to the presence of 8 supporting pillars in the arena. The pillars are pictured in Starticket’s sales system (on the map available at starticket.ch, upon seat selection) with a black dot. The seats concerned are proposed at discounted prices due to the degree of visibility obstruction. I would like to bring my child/children to the show. What information do I need to know ? Throughout the duration of the show (approx. 2 and a half hours without intermission) and for reasons related to safety and comfort, the show is not recommended for children under 6 years old. Are there places for people with reduced mobility (PRM)? How do I reserve one ? For the hearing impaired, a mobile app will be available with reception throughout the arena. Is there an entrance fee to attend the processions and access the Ville en Fête ? No, processions and Ville en Fête are free activities, open to all. Only access to the arena is paid. Can we purchase tickets on site, the same day of the show ? A number of tickets will be available at the cashiers’ desks at the entrance to the market place before each performance; this is to prevent ticket scalping to the extent of the remaining availabilities. What are the terms of transfer and reimbursement ? Any ticket issued won’t be returned, refunded or exchanged. In case of cancellation of the show as a result of adverse weather conditions during the first 90 minutes of the show, a postponement date will be announced. Beyond these 90 minutes, the show is considered to be performed and will not be refunded. If the show is rescheduled, the ticket remains valid for the postponement date. A maximum of 2 postponements is possible, following these the show will be cancelled and tickets refunded by Starticket. Is it possible to purchase group tickets? Ticket sales are limited to 20 per person. These tickets cannot be pre-ordered before they go on sale. Is it permissible to film or take pictures during the shows ? For reasons related to copyright and to allow the spectator to immerse themselves in the show, taking pictures and videos will not be tolerated during the performance. When will the replay dates of postponed presentations be made available ? As there may be several postponements and the same presentation may be postponed up to two times, the replay date will be announced at the same time as the postponement. As a general rule, the presentation from 11am will first be postponed to the afternoon of the same day if conditions permit. A presentation from 9pm will be generally delayed until the next morning, programme permitting. In addition, two days have been set aside exclusively for postponed performances, Monday, July 22 and Wednesday, Aug. 7. Finally, the last shows can be postponed to Monday and/or Tuesday, the 12th and 13th of August. Will it be possible to circulate in the arena during the performances ? There is no intermission during the show. Staff present in the arena will indicate when it is permitted to circulate and exit the arena. Are there combined offers ? Spectacle and meal: Our exclusive offer proposes a complete culinary experience on our Lake Pavilion platform, a ticket for the show in premium category, which includes all the premium benefits, and much more! More information under “Pavillon du Lac“. Welcome aperitif: Book spaces for a pre-show aperitif under “Les Terrasses de la Confrérie” (in French). Show and accommodation: Don’t hesitate to consult the offers of our tourism partners (Grand Hotel du Lac, Astra Hotel, Modern Times, Montreux Riviera) under “Package with hotel”. Tour operator transport and show: There are tour operators who offer such packages. We ask you to contact your travel agent to find out if such an offer is available in your area. When is the next Fête des Vignerons ? 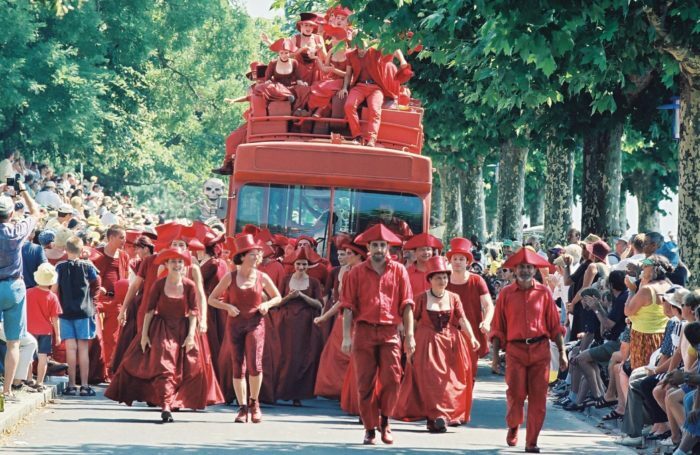 The performances of the 12th edition of the Fête des Vignerons will be held from July 18 to August 11, 2019. Public rehearsals will take place a few days before. When will the programme be available ? The performance schedule and the Canton Days have already been set and are posted on the website. The complete programme for the Ville en Fête and the Canton Days will soon be released. Subscribe to the Fête des Vignerons 2019 newsletter and you will be informed of its release. Where do I find the products from the Fête des Vignerons 2019 ? You will find the products on the online store of our Partner Many Ways which can be accessed from this website by clicking on “Shop” as well as at the shop at the Grenette in Vevey (from Monday to Friday 9h00-12h30 / 13h30-17h30) , Saturday 10:00 to 15:00 non stop). Is reduced mobility provided for ? The category of places reserved for persons with reduced mobility is primarily for people in a wheelchair. People without a wheelchair but with serious difficulties of movement, or any other significant disability, are also eligible for this category. Any person with disabilities can reserve a place in the same category for an accompanying spectator. These places are in the vicinity of the main stage. Access for wheelchairs will be available at entrance F and support is provided by our volunteers to facilitate your movement through the arena. Places for people with reduced mobility and their accompanying persons are in category 5 at CHF 79.- per person. For the rest of the arena, will there be access available for older people who have difficulty climbing stairs ? Our teams of ushers will be at your disposal to help you get to your seat. In the areas A2, B2, C2, D2, E2, F2, G2, H2, access to places will be up the stairs from the bottom of the arena. 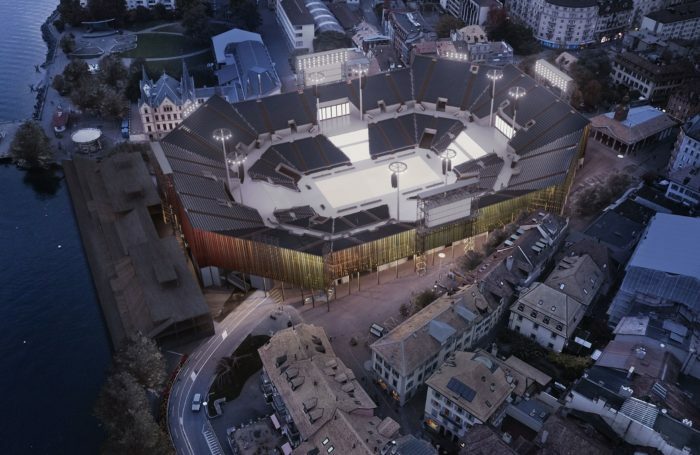 What facilities are provided for people with disabilities outside the arena ? Special parking is provided for people with reduced mobility at the outskirts of the city, close to the motorway exit. People with reduced mobility can take advantage of our special shuttle service. In addition, an area is provided for disabled transport near the arena. More information about this will be available at the beginning of 2019. Will special public transport be available ? Yes. After the evening performances (ending at 11 pm), CFF trains will be running in the direction of the Arc lémanique, Chablis and towards several Swiss Romand towns. The VMCV, the MVR, the CGN and other transportation providers will also take the Fête des Vignerons into account regarding their schedules. Is there a smartphone or tablet app ? Yes, a “Fête des Vignerons 2019” application is downloadable at the bottom of each page of our website, for Android and Mac. I can’t find the app on the App Store or Google Play; is this normal ? Yes, it is possible that the app won’t appear if your tablet/smartphone is an older model, or does not have some features necessary for the proper app function. Augmented reality is a technical way of interspersing the real world (physical surroundings which includes an image that serves as a marker) and digital items in real time. The background image is also called AR+. First, download and install the “Fête des Vignerons” mobile app for Android and iOS. Open the app and select “AR+”, then position your phone (or tablet) about 30 centimetres above the marker (image) and you will see the first augmented reality appear. Select the AR+ menu and you can choose two further augmented realities to display. Can one still register to be a performer at the Fête des Vignerons 2019? Registrations for performers are closed, but you may still register to volunteer to organize for the Fête des Vignerons. I registered as a performer or a volunteer, but I still haven’t received any further information. The event preparations are already in full swing. The main roles for the show have been casted, and the process of distributing roles for extras is in the beginning stages. Further information will be forthcoming in the following weeks. First role offers will soon be sent to the singers, musicians, gymnasts and dancers (adults). The invitation to child actors and other extras will follow with special attention paid to role groupings by family and other group participation. Costume measurement has also begun. Each of you will be contacted individually and will receive further information from us directly by email. Have the volunteer schedules already been set ? The various scheduling will be developed in 2019. You will be personally informed as soon as they are ready. Can I enrol in a volunteer committee ? The show changes according to the Cantonal Days? 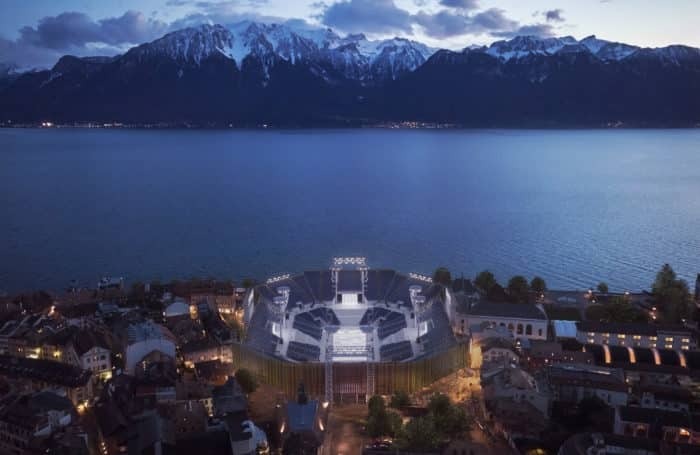 On the Cantonal Days, cantonal delegations will be welcomed to Vevey by the Confrérie des Vignerons. They will be presenting their cultural traditions, delicacies, music groups, troops of theatre or youth entertainment, not to mention the wine traditions. The show the Fête remains the same despite the different Cantonal Days. What is the Coronation? Is the show different? It’s the premiere of the show which includes the Coronation ceremony. It is during this event that spectators will have the chance to attend the Coronation, which praises and distinguishes the best winemakers’ hands of their generation (in addition to the usual show). Nothing happens when you click on a button or a link. Our website offers you external links, such as direct access to our partner Starticket ticket office (https://www.starticket.ch/fr/tickets/fete-des-vignerons-2019-20190716-2100-20190811-0100-arene-vevey) or to our partner Many Ways’ shop (https://www.fdvshop.ch), which should open in a new browser window. If nothing happens when you click on an external link, it is likely that your browser is blocking these windows from opening. 1. Click the Safari menu and select Preferences. 2. Click the Websites tab. 3. Select Pop-up Windows under the General menu on the left. 4. Click the dropdown menu “When visiting other websites” at the bottom right. 1. In Internet Explorer, select Tools, then Internet Options. 2. Under the Privacy tab uncheck “Turn on Pop-up Blocker”, and select OK.
2. In the upper right corner, click the icon of the three dots (“More”), then Settings in the dropdown men. 4. Under ‘Privacy and security‘, click Content settings. 5. Click Pop-ups and redirects. 6. At the top, turn the setting to Allowed. 1. Open Mozilla Firefox on your computer. 2. In the dropdown menu (upper right corner), click Preferences, and then click Privacy & Security. 3. Under the Permissions section, uncheck the box next to Block pop-up windows.